By Dan Ambrose: WBC super featherweight champion Miguel Berchelt (35-1, 31 KOs) will be fighting what many boxing fans feel is a needless rematch against former WBC 130 pound champion Francisco Vargas (25-1-2, 18 KOs) on March 23 on ESPN at The Forum in Inglewood, California. For the boxing fans that still remember the previous fight between Berchelt and Vargas in January 2017, they’ll see this fight as a needless one due to the one-sided nature of their fight two years ago. Instead of Top Rank making a needless rematch between Berchelt and Vargas, they should be looking to have Berchelt face Vasyl Lomachenko, since that’s a fight that would interest the boxing public a lot more than seeing the Berchelt-Vargas retread fight. If the Berchelt vs. Vargas previous fight had been competitive, then it would be understandable to see them go at it again, but it wasn’t. Berchelt beat Vargas like a drum in a fight that was not entertaining due to the one-sided nature of it. Even many of Berchelt’s own boxing fans saw the Vargas fight as being too one-sided for it to be a fun fight. Orlando Salido took a lot out of Vargas in his previous fight. What was left was a shell for Berchelt to beat up. Vargas was the WBC 130 lb champion at the time that he fought Berchelt. In Vargas’ previous fight, he’d taken a bad beating from Orlando Salido in a fight that was scored a controversial 12 round draw. Salido looked to be the much better fighter. Boxing News 24 scored the fight in Salido’s favor by a 117-111 score. Vargas was taking really bad punishment from Salido the entire fight. The judges gave Vargas what some feel was a gift draw. In Vargas’ next fight, the judges didn’t have a chance to score to score it, as Berchelt knocked him out. It was just as one-sided as the Salido-Vargas fight. The only difference was Berchelt didn’t let the judges score it. If so, then who knows who would have won the fight. Berchelt was ahead on the scorecards 96-94, 96-94 and 95-95. The judges’ scores were not indicative of the fight that took place. Vargas taking a beating the entire fight. He came close to winning to winning none of the rounds, as far as this writer is concerned. Berchelt completely dominated Vargas in every sense of the word, treating him like a punching bag from start to finish in knocking him out in the 11th round. The only positive thing you can say about that fight was Vargas was on his feet when the referee pulled the plug on the fight. 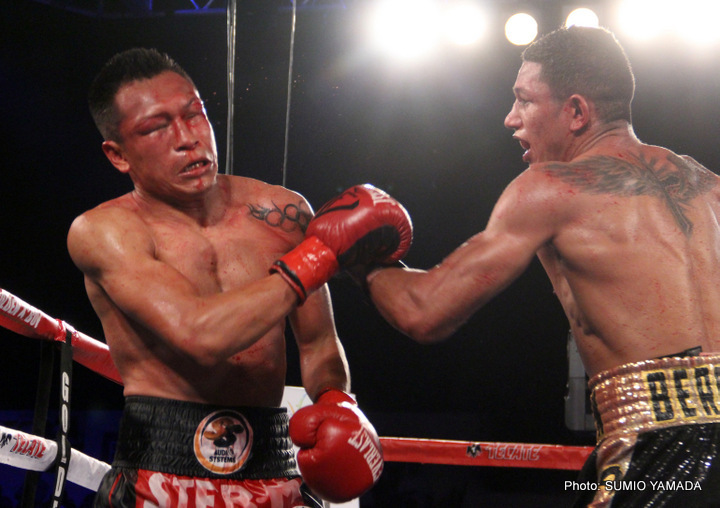 Other than that, it was a sick mismatch in which Berchelt appeared to win every round. Given how badly Vargas was beaten in that fight, he would be better off going after one of the other champions at super featherweight rather than facing Berchelt in a fight that he can’t win. The talent just isn’t there for Vargas, and never was. Berchelt vs. Vargas 2 will be the main event on ESPN on March 23 at The Forum in Inglewood, California. Vargas has won his last two fights since then, beating journeyman Rod Salka by a 6th round stoppage last April, and Stephen Smith by a 9th round technical decision in December 2017. Those are not the kind of fights that you like to see a challenger winning before getting a crack at a world title. Vargas should have taken on one of the good super featherweights like Evgeny Chuprakov, Miguel ‘Mickey’ Roman, Abner Mares, Lamont Roach, Jr. or Ryan Garcia. In the last two years, Salido has successfully defended his World Boxing Council 130 lb title four times, beating Takashi Miura, Maxwell Awaku, Johnathan Victor Barros and Miguel Roman. Berchelt has been the much busier guy, and he’s been fighting quality opposition, unlike Vargas. Berchelt’s recent ninth round knockout victory over Roman last November was an exciting fight. Unless the 34-year-old Vargas has found the Fountain of Youth, he’s going to get smashed to bits by the 27-year-old Berchelt in this rematch. Hopefully for the sake of the boxing public, this will be the last time Berchelt and Vargas fight each other. The fans need to see Berchelt fight guys that haven’t been beaten up by him yet, like Lomachenko. A rematch between Berchelt vs. Takashi Miura would arguably be a far better fight than Berchelt-Vargas. Miura at least had Berchelt hurt at one point in the fight, and he made it a lot more interesting to watch. But ideally, Berchelt needs to be facing Lomachenko, Alberto Machado, Gervonta ‘Tank’ Davis, Tevin Farmer, Masayuki Ito, Mikey Garcia, Robert Easter Jr., Luke Campbell, and Jorge Linares. Berchelt should be facing guys from the 126 to 135 so that he can find interesting opponents for him to mix it up with. Oscar Valdez from the featherweight division would be an excellent opponent for Berchelt, as would Leo Santa Cruz.